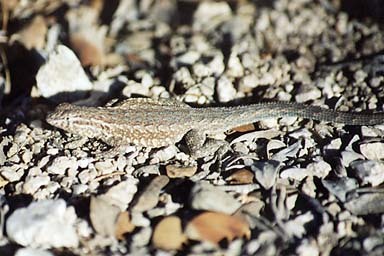 Side-blotched lizards are the most common lizards in the deserts of southern California. 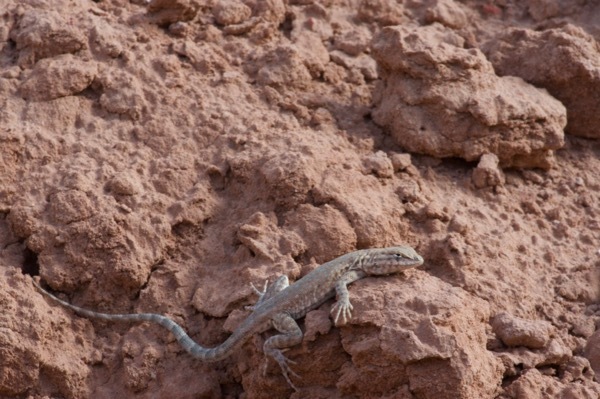 This side-blotched lizard was probably drawing a little more attention to itself than it intended. 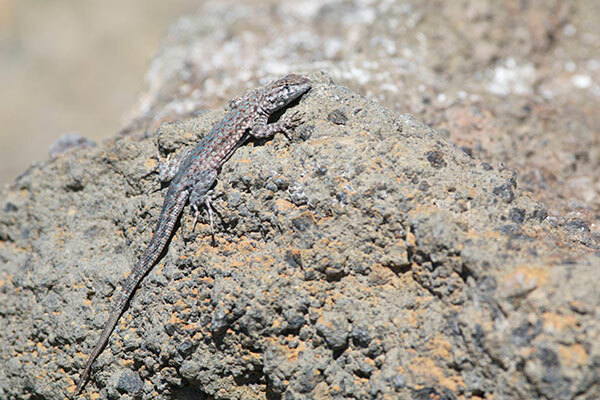 When I first posted this photo, I bemoaned my lack of certainty about the subspecies of Uta stansburiana, which caused helpful reader Jackson Shedd to point out that Smith and Brodie's guide lists 6 subspecies and includes range maps. 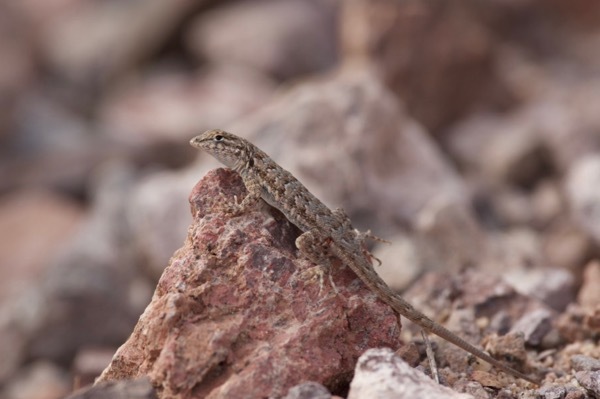 These subspecies have been revised since then, and I'm currently using the subspecies as described in the most excellent Lizards of the American Southwest. And Jackson Shedd is still a helpful reader and friend. 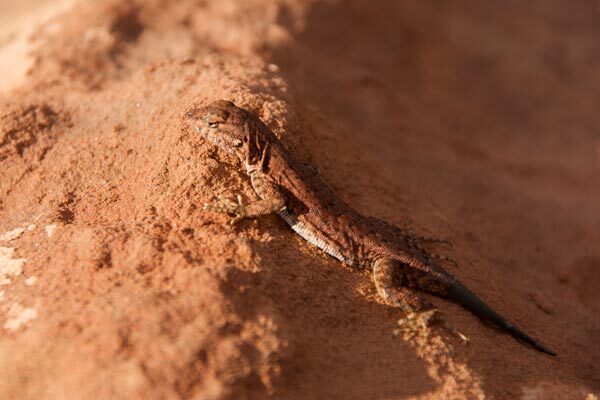 Red Rock Canyon is yet another thriving nest of side-blotched lizards. 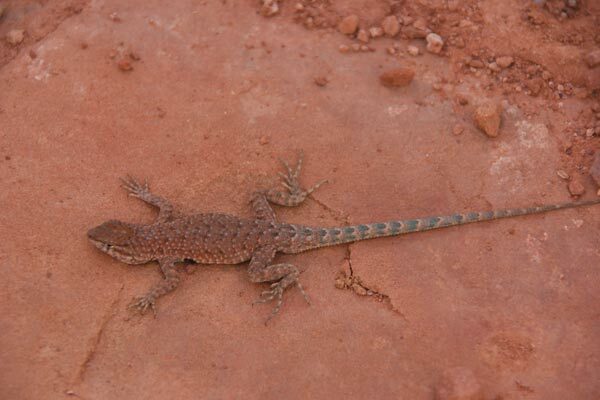 This one is female (the males, like the one above from Cholla Garden, are more speckly). Here is a vividly colored male at the height of its breeding-season colors. The scan doesn't do it justice, but this was one colorful lizard. 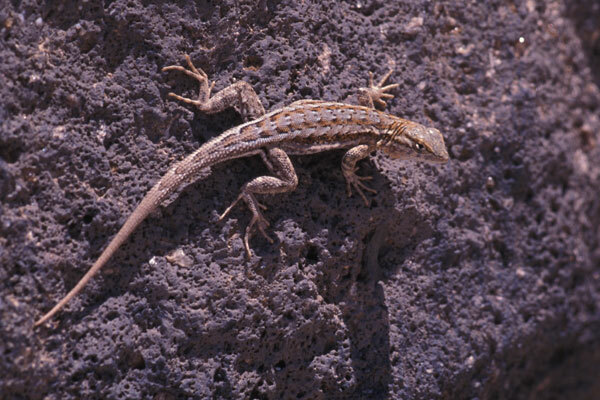 This is how to make baby side-blotched lizards. The male has a firm bite on the female's neck. She looks like she just wants to get it over with. This male was posing nicely among the beautiful and bizarre rock formations at Alabama Hills. 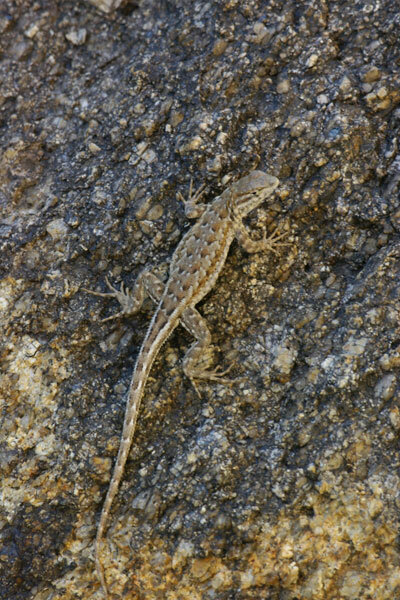 Perhaps I should start a collection of lizards perched in rock crevices, which would include this side-blotched lizard from California, a fence lizard from Utah, and a gecko from Australia. 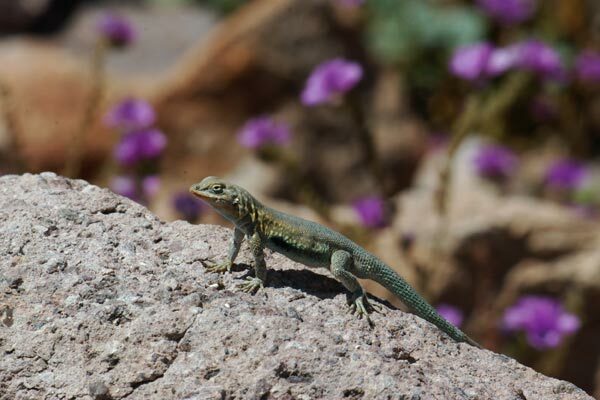 Having plenty of pictures of side-blotched lizards, I took this photo mainly to show off the purple flowers in the background. 2005 was a banner year for desert wildflowers in Death Valley and elsewhere in the southwestern U.S., and my wife's favorite color is purple. 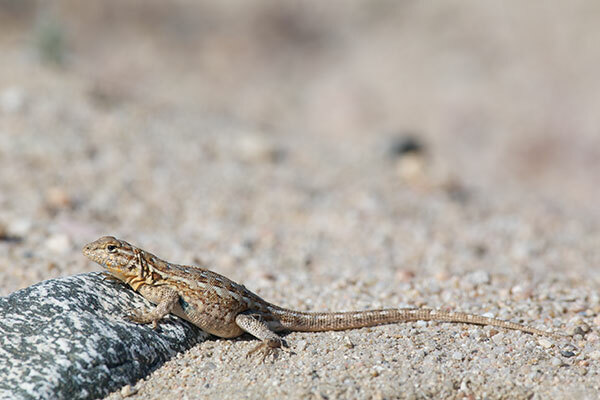 It was so hot when I was in Anza-Borrego that most of the lizards went into hiding for the day after about 9:30 AM. 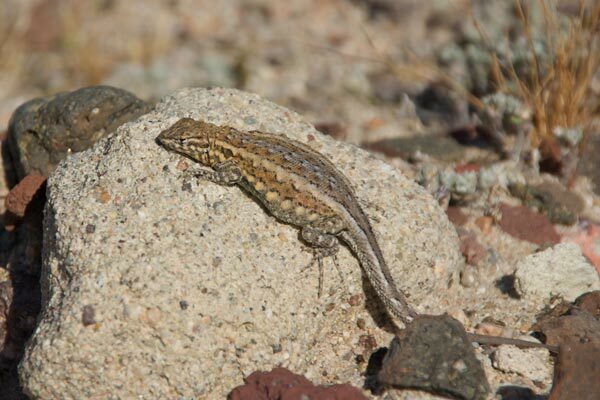 As usual in the desert, the side-blotched lizards were the first ones out in the morning, and as usual in the desert, they were out in force. This was one of the first ones I saw, at about 7:30 AM. 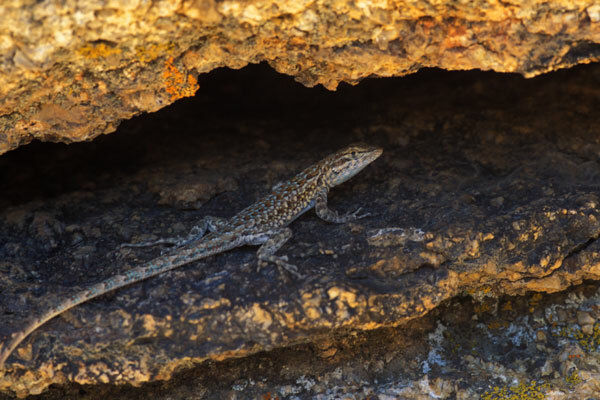 I stopped taking pictures of side-blotched lizards as soon as the less widespread and less common lizards started coming out, such as granite spiny lizards and banded rock lizards. 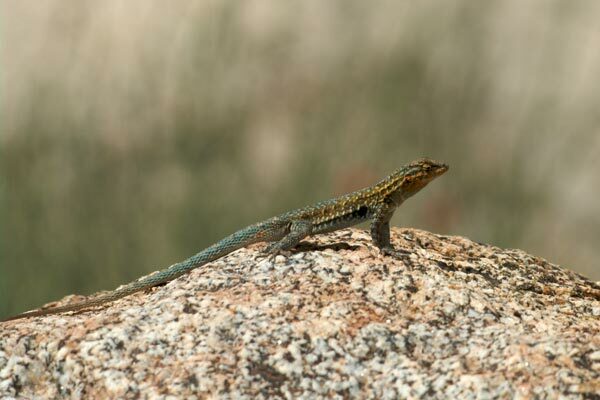 I did keep counting them though, and I ended up seeing 77 side-blotched lizards between 7:30 and 9:45. 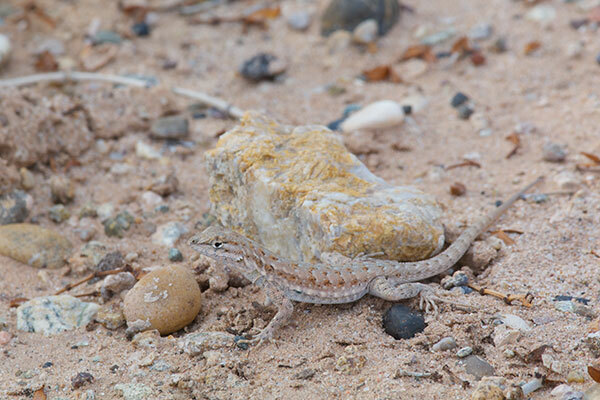 Here's an adult female Side-Blotched Lizard looking warily at me from its boulder perch. 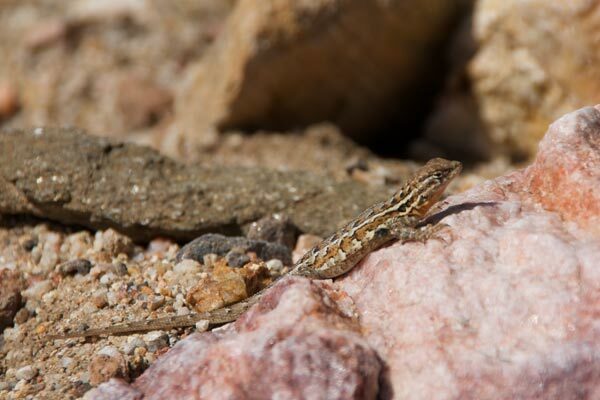 There weren't too many lizards out on that morning, but you can usually count on there being a few side-blotched lizards anywhere in the California desert. 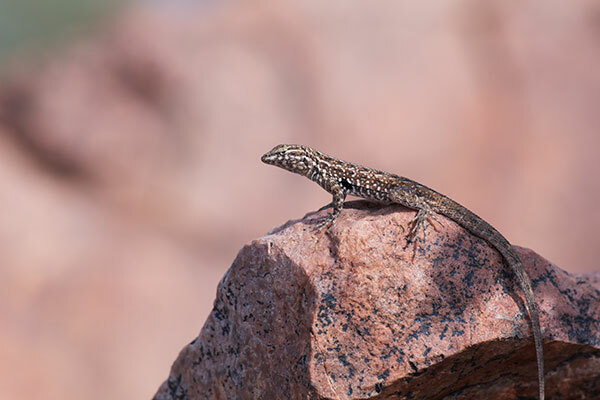 On a warm spring morning, it seemed like every boulder had a male side-blotched lizard at the highest point, trying to impress the gals. Some of them seemed to have succeeded in this endeavor. We had hiked for a half mile or so on a cool morning (low sixties) with no sign of reptilian activity. I was beginning to think that it was to be a herp-free morning when I spotted this pretty female on a pink rock. 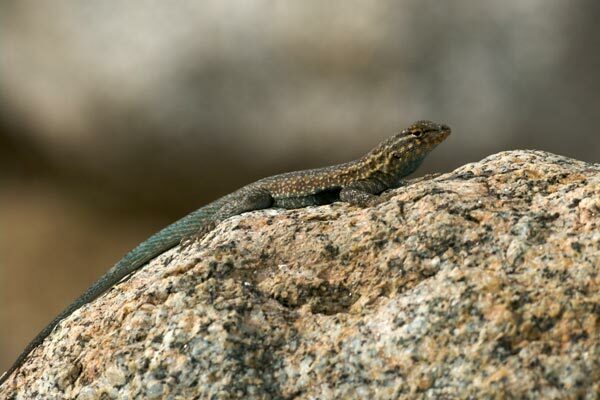 I later saw a few more side-blotched lizards and then a couple of very dark fence lizards. 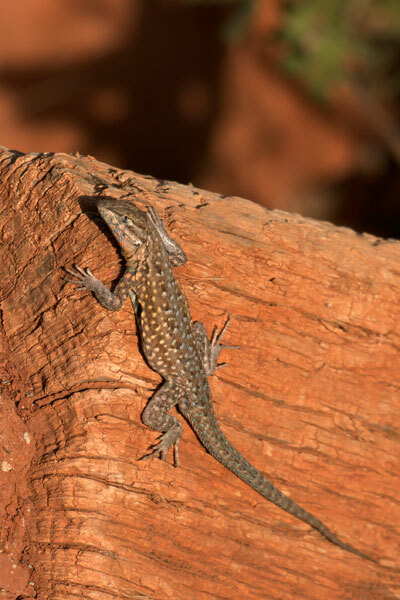 This is the second-most obviously gravid side-blotched lizard I've photographed. 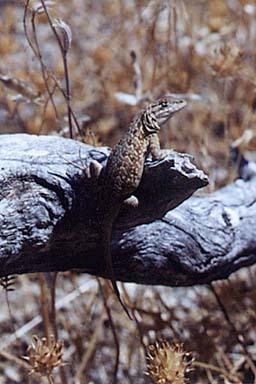 The islands off of Baja California are filled with a number of side-blotched lizard variants, many of which are considered separate species. 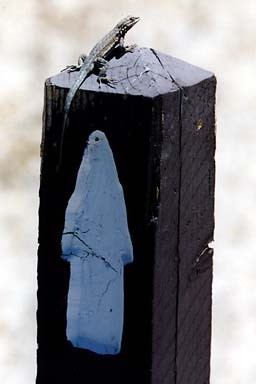 But the peninsula itself has the same old Uta stansburiana that populates most of the U.S. southwest. This is not the most pristine specimen, with its underleg mites and tail stump. 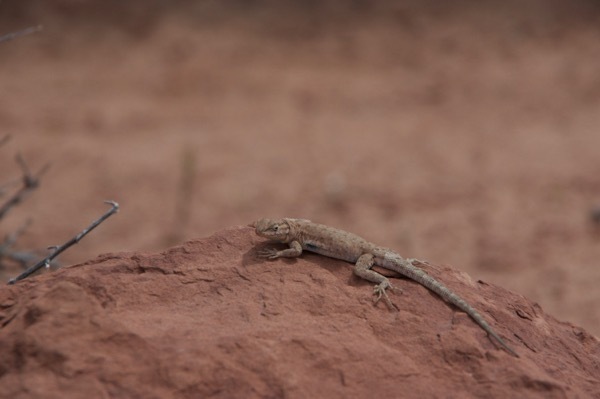 This is probably my favorite photo from this nine-day trip to southern Arizona, although this lizard is the most common herp in the area. He looks so proud, overseeing his dominion, while keeping a wary eye out for photographers and collared lizards. Pilot Knob sounded like a good place to hike from some description I had read on the web, but turned out to be highly degraded from (legal) off-road vehicle use. 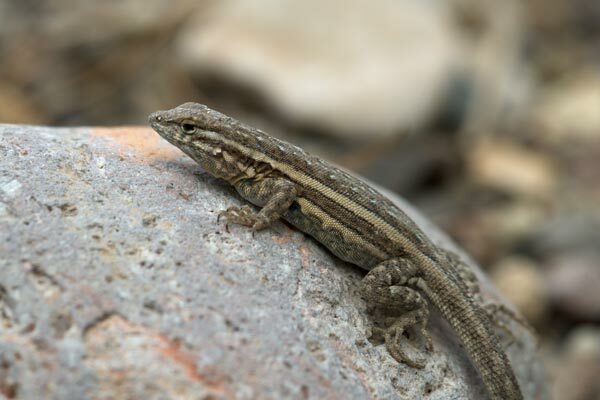 Maybe there were some more interesting animals lurking about somewhere, but all I saw in a quick visit were a few side-blotched lizards. 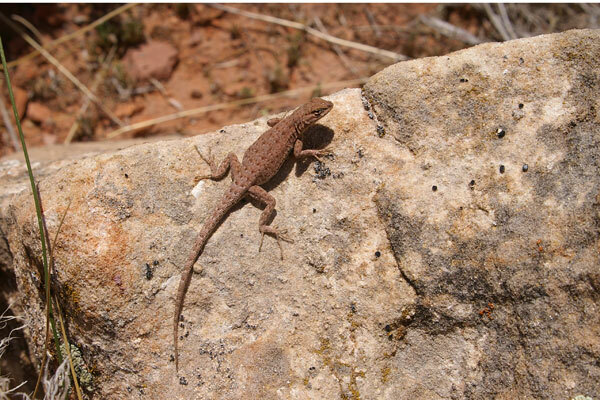 My first photographed side-blotched lizard from Mohave County, Arizona. Something to be proud of. 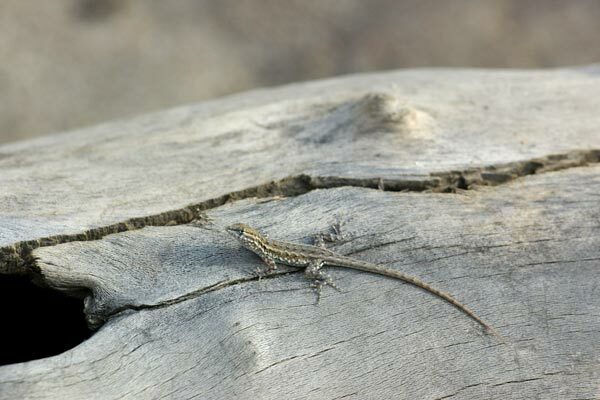 Definitely the least exciting lizard in Mexico. But any lizard is better than no lizard at all. Fort Rock is a castle-shaped outcrop of rock in the middle of an otherwise flat sagebrush plain. I wanted to visit specifically in the hopes of finding Pygmy Short-horned Lizards, but was unsuccessful. 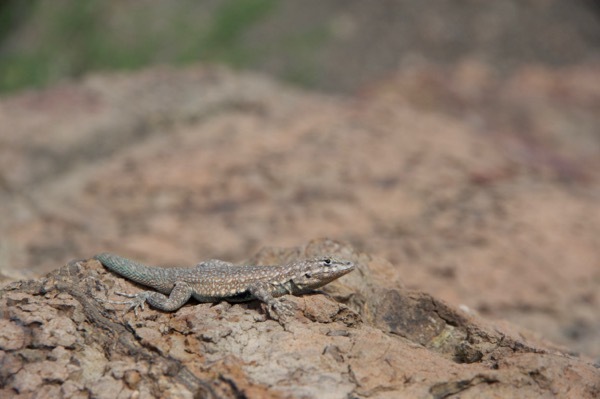 I had to take a new-to-me subspecies of side-blotched lizard as a consolation prize. 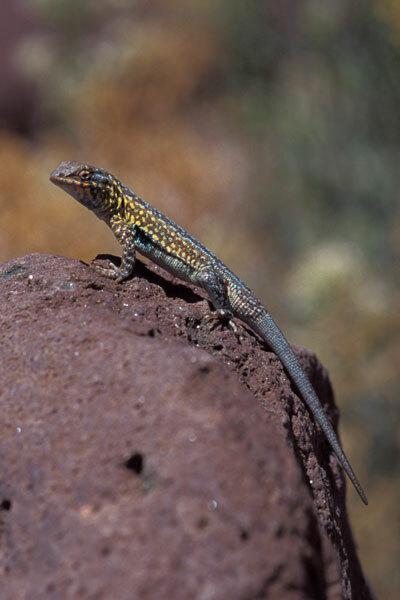 This genus was named after Utah, where these colorful little lizards were first identified in 1852. 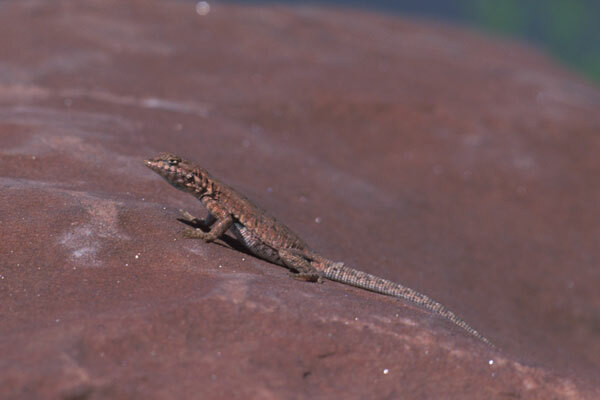 I am guessing that the Zion subspecies is U. s. stansburiana, but it might be U. s. uniformis. Please send me email if you know more. 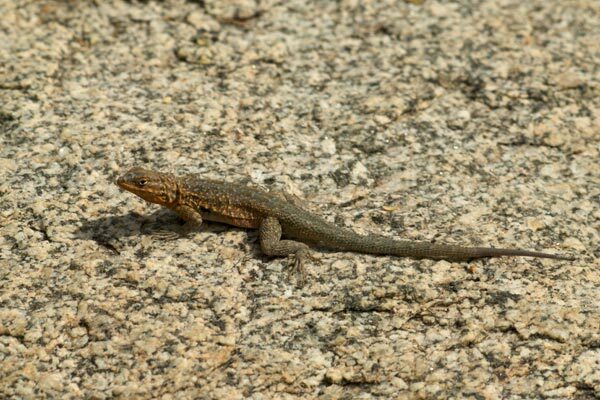 There wasn't much herp activity on a hot windy afternoon at Bitter Lake National Wildlife Refuge, but at least I finally got a photo of a local side-blotched lizard after several had escaped my camera earlier. 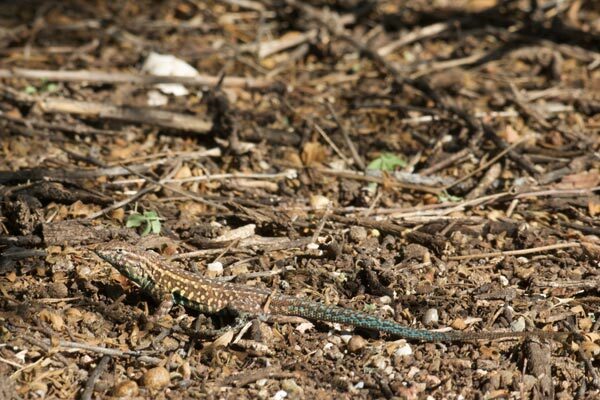 The next day I finally got a photo of one of the local male side-blotched lizards. 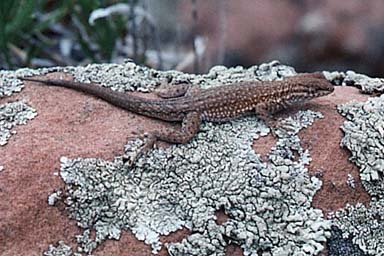 I saw surprisingly few side-blotched lizards in Big Bend National Park, compared to most U.S. deserts that I've visited. This chubby (probably gravid) female was the only one I saw one afternoon. Usually when I see one, I end up seeing dozens. 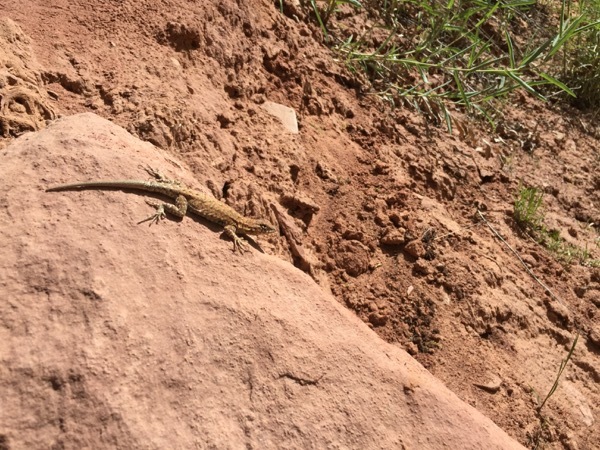 I only saw a couple of side-blotched lizards on a late afternoon hike in Palo Duro Canyon State Park also, but that was still two more lizards than I saw of any other species on a chilly afternoon. 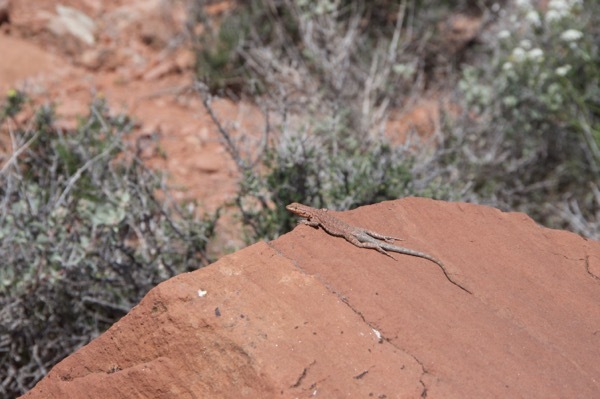 The side-blotched lizards here had evolved a nice reddish color for camouflage against the beautiful red rock formations of this park, which is near the similar but more famous Canyonlands National Park. 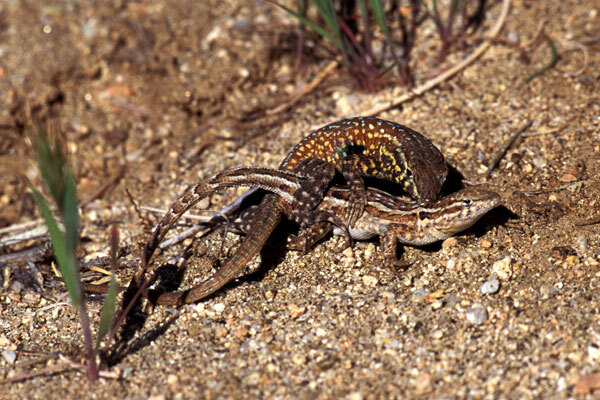 Plateau side-blotched lizards tend to be less colorful than other subspecies (hence the uniformis), and these two were no exception. 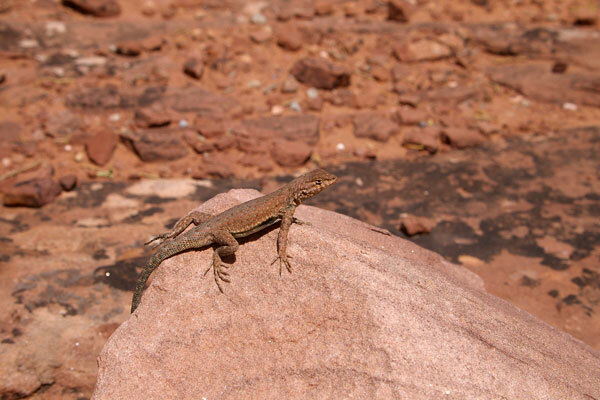 They do blend in nicely on the red rock formations though. The first photo is an adult male, and the second photo is an adult female. Here's another pair showing off how remarkably drab this subspecies is. More drabness, but I like how well they match the reddish rocks on which they hang out. This one's going for a sort of two-toned effect. Still not un-drab. I suppose I could have been taking photos of the spectacular geology at Arches National Park instead. 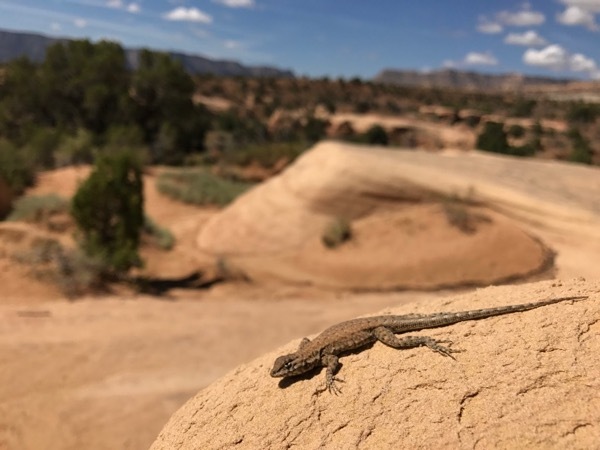 I saw a handful — but only a handful — of side-blotched lizards in the nearly vegetation-free interior of Goblin Valley State Park. 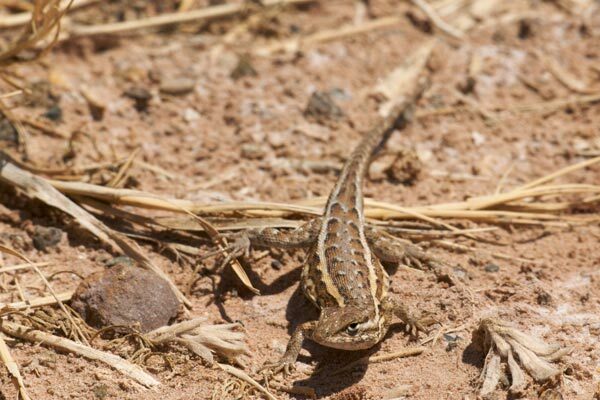 It seems like the terrain wouldn't support much lizard density since there were so few plants and thus so few insects for the lizards to snack on. I pondered how these little guys could find mates, but obviously they've been doing so for a long time. 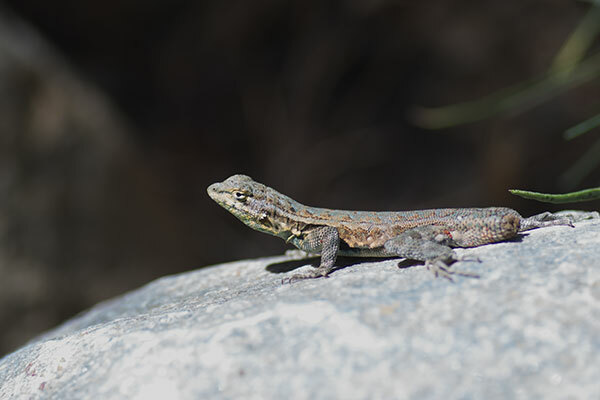 While the rest of my group was carefully posing their ten-plus collective dogs, I snuck away to look for scenically arranged lizards.